Hi everybody! I hope you all had a great weekend. My nails are still quite short, but I'm actually very comfortable with this length. I think they look edgy and also my polish lasts so much longer on these shorter nails! I've been wearing Color Club Where's The Soiree (the black) for three whole days now and there's not a single sign of tipwear. A year ago I wouldn't really have cared about the wearing time, since I changed my nail polish daily back then, but now that life's busy again I certainly don't have the time or energy to do that anymore. Anyway, after three days of black I really needed a change, so I went for a trusty tape mani. :) Nothing too difficult though, basically the design consists of one big and one smaller rectangle. First I used China Glaze Adore, a wonderful light blue metallic, then I made the smaller rectangles with Where's The Soiree again. So a quite simple design that reminds me of little windows when I look at my nails. ^^ Thanks for reading! Those are odd, but cool! Sometimes my favorite manis don't translate to my short nails. I think I could do ( or at least try ) this one. Thanks for the inspiration you provide. This is very unique. I love the colors you used and it has a neat effect. *jaw drops* I hope you don't mind if I attempt this one! Cute! I think I need Adore! Cute and creative! Love it. Pretty! I have to try these! oi oi, that is so beautyfull mani! love this! I love seeing neat designs on short nails! I´m from Brazil and loved your blog, so pretty and creative nails! Great idea, and the different shape really makes it pop. 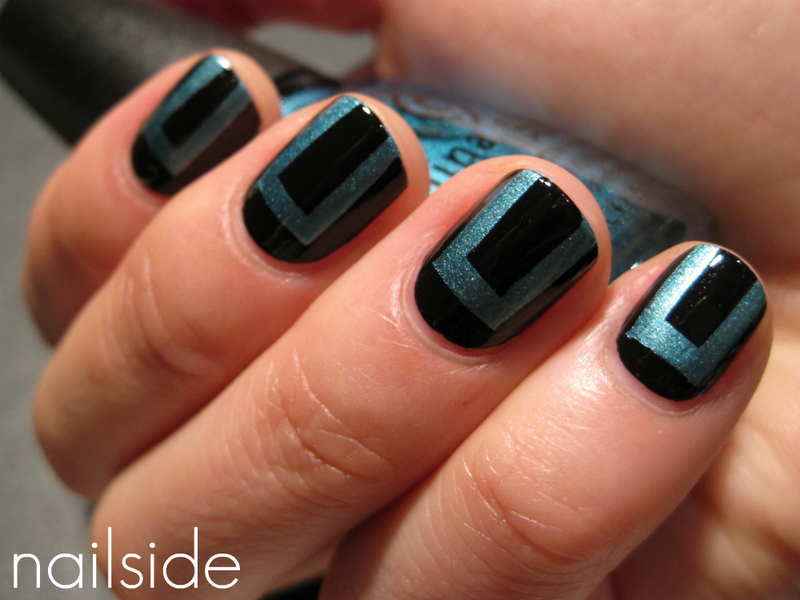 I have a "thing" for really clean and STRAIGHT lines, so tape mani's are perfect for that. I think the different shape really makes it this "pop"... I also have a thing for clean and straight lines. Really like this. This is such a great idea for people who are slowly, but surely, growing out their nails. Like me! This is such a great design for people who are slowly, but surely, growing out their nails. Like me! So cute!! I like the short nails. This is fantastic. So futuristic and sleek looking. I so want to try this! Thank you for sharing it.